Benoît Zimmermann owner of the top ranked chesnut gelding Chesall Zimequest (Holst, 2005, Casall Ask x Milva V x Concerto 4) has been named Owner of the Year for 2016 by the Jumping Owners Club. Ridden by French Olympian and Star Rider Simon Delestre, Chesall Zimequest enjoyed a long list of successes throughout 2016, including 2 victories in CSI5* Saint-Tropez, a victory in both Valence and Knokke Grand Prix, a second place in the Global Champions Tour Grand Prix in Rome and a second place in the World Cup Qualifying Grand Prix in Oslo. The pair also placed many times in various high-level classes throughout the year. 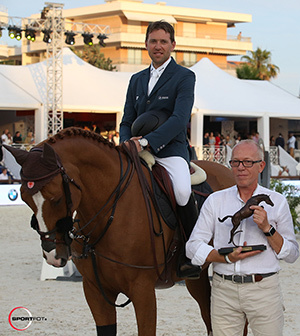 The Award was presented in Cannes to Benoît Zimmermann, owner of Chesall Zimequest, by Christian Baillet, President of the Jumping Owners Club, and François Bourey, President of the International Jumping Cannes CSI 5*. The Owner of the Year Award was created in 2004 to recognise the most successful owner of each year in the discipline of Jumping. To determine the winner, a classification is established for all horse and rider combinations based on points during the calendar year. The owner of the horse of the winning combination receives the award; a bronze sculpture specifically created for the Jumping Owners Club. “The Owner of the Year Award goes to a very loyal supporter of our sport whose passion for horses led him to not only breed, own and ride horses, but also to sponsor Simon through his company Factum. I am thrilled to reward M. Zimmermann’s continued commitment to our sport. He has been a true supporter of Simon Delestre for many years and we are proud to contribute to a well-deserved recognition”. M. Zimmermann stressed the meaning of this award, « I am both moved and proud to receive an award which I owe to an amazing horse, Chesall Zimequest, but also to the extraordinary combination he makes with Simon Delestre! Chesall Zimequest enters the exclusive club of legendary horses who have received the Jumping Owners Club’s recognition in the past : Hickstead, Big Star, Cella, Shutterfly, Casall ASK and Quickly de Kreisker, to name a few. This award which goes to a French owner for the first time, reminds us that horses owners are an essential and legitimate part of high-level sport. They take risks, support their horses, help develop optimum strategies with their riders and are spellbound by every class. Chesall Zimequest wins with his respect and sensitivity. Some say his eyes are on his hooves. Within two years, Simon helped reveal the horse’s incredible quality. I would like to extend my deepest gratitude to Simon for giving me the opportunity to be a part of this extraordinary journey.